Enjoy this holiday treat from Eden Foods! Heat oil in a large pot and pop corn according to package directions. Place popped corn in a large mixing bowl. Add the snack mixes. Place the barley malt and maple syrup in a saucepan and bring to a boil. Reduce the flame to medium-low and simmer, stirring frequently for 5 to 7 minutes. Pour the hot syrup over the popped corn mixture. 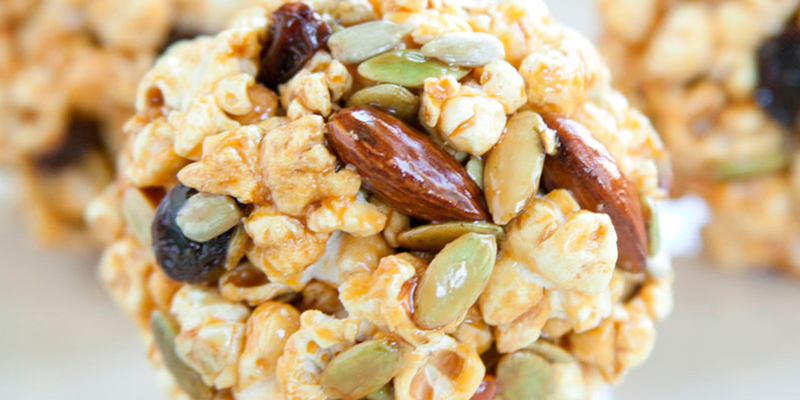 Mix thoroughly until all popcorn mixture is completely coated with syrup. Pour 1 cup cold water into a small bowl. Lightly moisten your hands with the cold water. Take a handful of the popcorn mixture and form it into a ball while packing firmly with you hands, just like you would if making a snowball. Repeat the above steps, making sure to moisten your hands before making each ball. Wrap the balls in wax paper or baking paper, or place in a covered container and freeze until the syrup hardens.